Now Doctor Who fans like you can have this fun Tardis Mini Backpack. This is not a big full-size backpack but more something to carry your important stuff. The Doctor Who backpack is 8 1/2 x 12 x 4 1/4 inches making it plenty of big to replace a handbag or something like that. 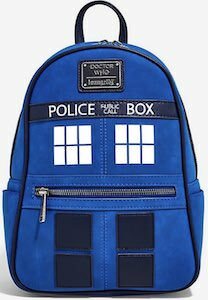 The Tardis backpack has a suede kind of look in Tardis blue and even the straps are blue only a bit darker. With a fun Tardis bag on your back, it will feel like you are traveling with the Tardis in Doctor Who style. Click on the image to see the backpack from all angles and even inside.